A 150-inch screen overlooks the 100-person capacity dance floor in the standing-room-only space. "I'm very satisfied with the fabulous image quality,"says Takayuki Nishimura, general manager of BAR bowl. The purpose of the club is to provide a space for people to drink and enjoy hip-hop, so the video projections are seen as "BGV (background video). However, we have various projects in the works that will make full use of the big screens and vivid images, as we continue to expand the range of our business activities. "BAR bowl" has opened in a bustling, youth-oriented section of Kyoto that borders on the Gion and Pontocho neighborhoods with their rows of traditional wooden houses. The clientele drink and dance while a DJ spins the latest hip-hop tracks. Vivid moving images produced by a Panasonic DLP™ projector provides the backdrop. BAR bowl occupies a space that formerly contained the Kyoto branch of a nationwide chain of bars, of which Mr. Nishimura was an employee. When the head office of the chain decided to withdraw from Kyoto, Mr.Nishimura took over the space, and made the decision to open a new spot of his own: BAR bowl. 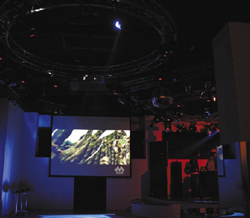 When designing the new club, he wanted to feature large-scale projected video, as in the previous club. A proposal from Panasonic, which has a close relationship with the design firm in charge of the club's interior, led him to settle on the PT-D4000 DLP™ projector. "The images from the projector in the previous club were dark and melancholy, but I'm happy to say that the new images are bright and vivid,"says Mr. Nishimura. "The images may be 'background,'but the images on the 150-inch screen really liven up the atmosphere. I'm very pleased." A PT-D4000 unit is suspended from the ceiling. 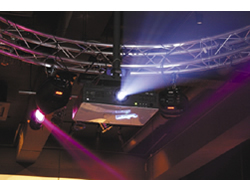 As the large-scale projections are one of the club's selling points, they can't be turned off during business hours. On weekends, it's not uncommon for them to stay on – for more than eight hours – from when the club opens in the evening until the following morning. "As we use them for long periods of time, durability is the most important thing." With Panasonic DLP™ projectors, which are essentially immune to age- and dust-related degradation, there is no need to sacrifice image quality even with long periods of use. Also, the duallamp setup means that "there’s no need to worry about gaps between images," and better customer service can be provided. 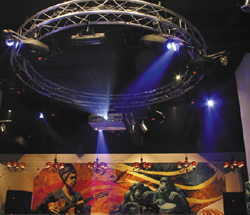 Earthshaking beats and vivid, large-scale images heat up the club’s atmosphere. The club is open from the evening until the following morning, but it would be a waste not to use the space for anything in the afternoon. Mr. Nishimura tells of "two customers who met by chance at the previous club and ended up getting engaged. They wanted to hold their post-wedding party in the place where they met, so I decided to give it a try. "During the party, he plans to project a video of the wedding ceremony on the screen, making the projection a centerpiece of the party. Describing his ambitions, Mr. Nishimura says, "naturally I'm hoping for good business results at the club, but I also hope to try my hand at other projects. In addition to wedding parties, there are lots of ideas for parties, mini-concerts and so on, featuring large-format video, that I'm planning to create proposals for. "It appears that he plans to make the most of the large-format projection equipment at hand to aggressively pursue a variety of business ideas. A "Bright Project" is being planned in which brilliant images on the large screen will play a vital role.